Providence Valley sponsors our missionary, Rev. Dr Elisabeth Johnson, who serves as a seminary professor at the Lutheran Institute of Theology in Meiganga, Cameroon where she teaches students preparing to serve as pastors and leaders in the Evangelical Lutheran Church in Cameroon and other countries in Western Africa. 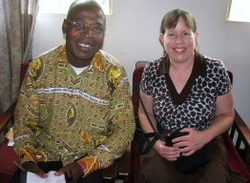 She also assists in providing continuing education opportunities within the church in Cameroon and in creating networks and connections between the Theological Institute and other global theological institutions. Rev. Dr. Elisabeth has also taught courses on the Gospels and the Pauline Tradition and has written Biblical commentary for Luther Seminary's website for pastors, WorkingPreachers.org. She has also been published in the Augsburg Adult Bible Study Series, including articles Covenant Communities (2009) and A Living Faith (2012).